This substantial volume is a re-issue of Attenborough’s first three Zoo Quest books, recounting his expeditions to Guyana, Indonesia and Paraguay in the late 1950s, “slightly abbreviated and updated from the originals,” as he says in the Introduction. The Zoo Quests were joint projects of the London Zoo and the BBC in which minuscule expeditions set out to collect wildlife for the Zoo with a TV cameraman recording the process. Collecting expeditions were regular operations of all zoos at the time, and I for one grew up loving Gerald Durrell’s very funny books about similar expeditions, but making one into a TV show was a novel idea since nearly all TV of that period was ‘live’ in the studio. As a young BBC TV producer with an unused zoology degree in his recent past, Attenborough was well placed to pioneer the genre. A short initial trip to Africa was successful enough that a longer one to South America was approved, and the rest we know. As Attenborough says, the world has changed considerably since then and what was then adventure writing now reads as history – a lively history, to be sure, but not an account of the world we live in. It’s no worse for that, since such a fresh, open-eyed description of that world can tell us much about our own, and it’s still entertaining. Two or three young blokes improvising their way through wild country with the help of chance-met (and often strange) guides could hardly be dull, and Attenborough’s love of nature’s oddities was as infectious then as later. Reading these Adventures of a Young Naturalist reminded me of a whole epoch of pioneering nature writing which has almost been forgotten by those old enough to have read it when it was new and therefore unknown to younger readers. Should I jog the collective memory? I think so. 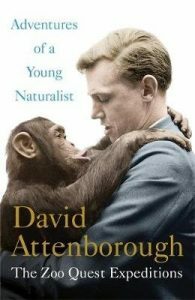 Christmas approaches as I write, so I’m going to suggest Adventures of a Young Naturalist would make a suitable gift or holiday reading, both for baby-boomers with an interest in wildlife and for younger people who have enjoyed Attenborough’s TV work for years but missed its early stages.